Mouchette.org is an interactive website created in 1996 by a virtual person, a pseudonymous character, an Amsterdam based artist who calls herself Mouchette. With her innocent salutation and claims to be “nearly thirteen” greeting us from the introduction page, what initially appears as a personal website of a pre-pubescent female artist, evolves into darker themes in the subsequent pages. The creator of the website has been a closely guarded secret. While the use of taboo subject matters are what initially provokes heated reactions, the manipulation of cyber-identity and the ability of the creator to maintain anonymity for so long are the significant reasons this website has garnered its international reputation in the internet art community. Mouchette.org marks a pivotal transition in Neddam’s work from the actual to the virtual realm. Created in 1996, Mouchette.org exists as the personal, interactive website of a self-proclaimed ‘almost thirteen year old’ artist living in Amsterdam. The work is now internationally recognized as a key work in the history of Internet art. 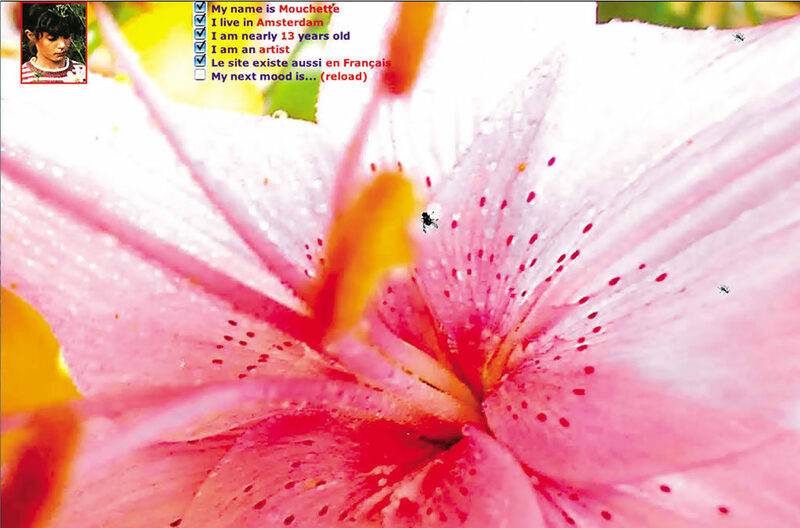 Making use of the basic online tools available pre-web 2.0, such as question and answer and multiple-choice forms, Mouchette.org incites users to navigate the pages and interact with the seemingly innocent girl, in order to discover her corky, sexualized and dark sides. Mouchette’s virtual persona is roughly based on the movie by Robert Bresson by the same name. Since its inception in 1996, Mouchette.org has morphed and has been exhibited in various forums internationally. Interest in the work spans the art world, academia and internet users and fans worldwide. The artwork is the subject of much critical discourse and heated commentary on the construction of identity and anonymity enabled by the internet. The recent attribution of the work to Martine Neddam has not weakened the lure of the virtual persona. Mouchette remains in contact with daily visitors to her site and Mouchette.org continues to emerge in various forms in a wide-range of off and online exhibitions and events.